Truck drivers claim that the only way to make ends meet is to disregard speed limits, over pack their trailers and neglect truck maintenance. A survey conducted by the Transport Workers Union displayed that 56 per cent drivers had to neglect vehicle maintenance because of the weight of the economic pressure. Approximately 30 per cent explained that they had to drive well over the speed limit, and 40 per cent believed they had to work longer than is legally permitted. 17 per cent claim they felt pressure to hold a illegally outsized truck load. Union secretary Tony Sheldon stated that the results confirm a growing crisis throughout the industry. According to Sheldon, there has been an increase in fatalities.In 2010 there were 142 countrywide deaths as a result of crashes involving trucks. Other stats indicate that 72 per cent of all car crash deaths involving trucks were the deaths of occupants of other vehicles. The survey was conducted with the involvement of 715 transport workers and included included long and short-haul drivers and couriers.The union desires an independent industry body to monitor pay rates, contracts and working conditions to ensure the mental and physical well-being of drivers. There was no mention in the article regarding the newly introduced national trucking regulatory body. 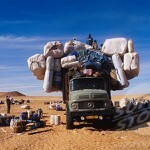 The carriage of loads brings with it a great amount of risk. This risk is increased if you and your colleagues do not adhere to safe load restraint practices. Load restraint training is designed to help you reduce the risks. The load restraint training courses available will cover all areas of load restraint in detail. It is clearly stated in the Performance Standards in the Load Restraint Guide that a load restraint system must be capable of withstanding a force equal to 80 percent of its weight in the forward direction, 50 percent of its weight in the sideward and rearward direction, and 20 percent of its weight in the vertical direction. The load restraint guidelines are proven principles – they are not just devised to make life harder, but they are designed to make life safer – yours and the lives of others. They relate to the maximum acceleration or “g” forces (in the Performance Standards) that a vehicle will meet in all conditions. Load restraint training informs drivers of these and all other relevant guidelines for risk reduction. If a load is restrained to these standards it will not move or fall off in all normal driving circumstances, including the hardest of brake stops – to the point that skid marks are left on the road, or the vehicle rolls over. If you fail to adhere to any of these elements , then you are in breach of the law and are liable to be prosecuted. It is not enough to pay “lip service” to the key elements of load restraint. The consequences can be dire. Complete your load restraint training to ensure you are armed with the relevant knowledge. Your adherence to the key elements of load restraint should also take into consideration the driving techniques used for laden vehicles, the restraint methods for general freight, methods for calculating restraint requirements, vehicle capabilities and the load restraint equipment capabilities. You’ll find that the Load Restraint Guide, together with the load restraint training available, provides you with information on all of these areas. There is an identified need to improve the awareness and understanding of load restraint issues, including the contents of the Load Restraint Guide. The importance of load restraint training can be measured in the security of the load and the protection of lives, both those of the drivers and other road users. It is vital that all involved in the carriage of loads display a professional attitude toward the importance of load restraint and have a clear understanding of the chain of responsibility. Load restraint training is an important part of this. The penalties involved for incorrect load restraint practices can be either on the spot fines or prosecution in a court of law. As well, the Court may apply a jail sentence. Either way there is disruption to the carriage of the load and in many cases severe financial repercussions. The safe carriage of loads affects us all. It is your responsibility to ensure you undertake load restraint training, including knowledge of the relevant documents which outline the procedures for the safe carriage of loads. Load restraint guidelines are based on proven principles and the ability of load restraint equipment to apply the necessary restraint forces. Being aware of current load restraint guidelines is vital in the safe carriage of a load. Load restraint training focuses on general load restraint awareness, and also includes key elements of load restraint practice. We will also explore common beliefs regarding load restraint and case studies involving load restraint. What are the vehicle owner’s responsibilities for load restraint? Although the driver is responsible for the conduct of the vehicle, in many cases the owner can be responsible for the restraint of the load. As an owner, it is their responsibility to ensure that all employees, including any contractors used, abide by the rules of load restraint, as laid out in the Load Restraint Guide, and know what the Performance Standards mean. They need to ensure all employees understand the characteristics of loads and why loads move. They should also schedule regular load restraint training (TLIA107C or TLID407C), and have the load restraint responsibilities of each position clearly defined within the position description. As part of your company quality manual, the guidelines for load restraint should be detailed so that each member involved is fully aware of their responsibilities and actions. Load restraint – what are the driver’s responsibilities? Here are some of the load restraint responsibilities of both the driver and the operator. What are the General Responsibilities for Load Restraint? All members involved in the safe carriage of loads are responsible for the correct application of load restraint. The only difference is the degree of responsibility. Depending on the individual arrangements, the degree of responsibility may change for each member involved.